How to draft a Legal Confidentiality Agreement Word template? 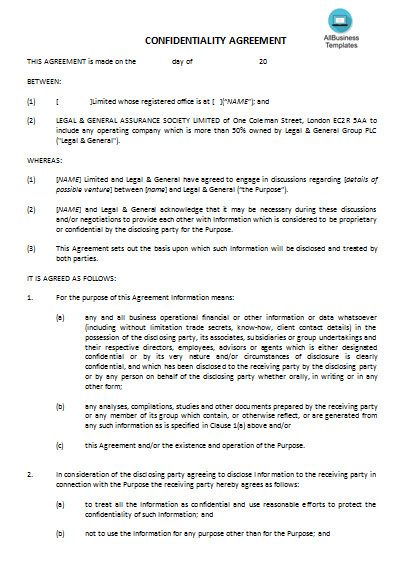 An easy way to start is to download this Legal Confidentiality Agreement Word template now! Legal confidentiality agreement is one-sided or restricted assent, in which one gathering attempts to keep data revealed by the other party private. Notwithstanding the essential classification commitment, the beneficiary of the data must utilize sensible efforts to establish safety to shield the data, and must at all times demonstrations in compliance with common decency in connection to the data. Download our Legal Confidentiality Agreement Word template now for your own benefit! This template will perfectly suit your needs!